This preliminary information communicatesa service engine soon lamp with p050f. check vacuum system for proper operation. if vacuum system is operating properly, replace brake booster. This informational bulletin provides information on oem and remanufactured engine and automatic transmission/transaxle identification. This bulletin provides graphics, information and guidelines for engine component wear that require repair and not engine replacement. This engineering informational bulletin is requesting information from the field on vehicles that have the condition of vehicle no start, stalls repeatedly and/or smoke from under hood at battery. This technical bulletin provides a procedure to check the temp sensor connection and program the ecm. This preliminary informational bulletin provides information regarding the normal characteristic of instrument panel red brake light intermittently comes on. This informational bulletin advises the possible issues that may occur using a scotch brite pad or highly abrasive disk on engine surfaces. This informational bulletin provides information for engine oil life monitor operation calculation. This informational bulletin provides a revision for 09-06-04-015b (vehicles sitting outside on dealer lots for extended periods with hard start/no start condition) to add the 2015-2018 model years. This warranty administration bulletin provides dealership personnel with policy and procedure requirements for essential tools that include consumable parts (u.s. only). This preliminary information communicates if a slight shudder is felt during a shift at speeds of 40 mph or below to perform a trans fluid drain and fill and to perfrom a cooler flow test to flush the cooler. This preliminary information communicates a diagnostic trail to a likely conclusion for lean codes on these vehicles. This technical bulletin provides a procedure to replace the rear differential assembly if found to be the cause of the noises heard while in fwd. This warranty administration bulletin provide policy information for automatic transmission oil cooler flush and flow test. This technical bulletin provides a procedure to program the rdccm to correct a drivetrain whine/moan an/or clunk when in awd. This technical bulletin provides a procedure to replace the transmission valve body separator plate for an upshift condition. This bulletin provides information on the harmful effects of water or ethylene glycol in transmission fluid. This preliminary information communicates if a slight shudder is felt during a shift at speeds of 40 mph or below to perform a transmission fluid drain and fill. This preliminary information communicatesa "forward collision system reduced" message displayed on the dic when theforward automatic braking has been set to the "alert" setting. this is normal when thefab has been set to "alert". This technical bulletin provides a procedure to perform diagnostics on the codes set and if no problem is found, to replace either the input or output speed sensor. This technical bulletin provides a procedure to update the side object sensor modules to correct the customers concern. This informational bulletin provides information on tail lamp harness replacement to correct the rear turn signal flashing fast. This informational bulletin provides information on audio volume stuck high or low with no dtcs and that this is a normal characteristic. This informational bulletin explains to the dealer how to cover a possible customers mistake when a fuse has been blown. This technical bulletin provides a procedure to repair the crankshaft positioning sensor wiring harness by installing a new wiring harness. This preliminary information communicatesses lamp with dtc u1345. inspect connection at the upper and lower aero shutters for water. clean and repair as needed. This technical bulletin provides a procedure to test the radios receiver if certain xm channels cut out (mutes) depending on location of the vehicle. This technical bulletin provides a procedure to replace the hmi module to correct a condition of radio control (ics) display does not remain off at times after it has been turned off in the radio settings menu due to a software concern. This technical bulletin provides a procedure to properly reprogram an onstar module to correct a condition of red led, no wifi operation, and/or limited onstar® module functionality after onstar module replacement for another condition. This technical bulletin provides a procedure to install a twisted 3 jumper harness to address a service awd message on dic with dtcs c1266 or c1267. This informational bulletin provides information to the customer about the rear camera guidelines not being present at times due to the vbm taking over the rear camera option. This informational bulletin provides information to the customer on the radio display "info pages" being blank and to make sure to select in the "active info pages" menu. This preliminary information communication advises the technician how to determine if the vehicle is equipped with wireless fidelity. technician should check the regular production option code list for (vv4). This informational bulletin provides to the tech the new version of sps that will prompt warnings when trying to reprogram modules that have been already reprogrammed. This informational bulletin provides the dealership with how to prep a vehicle for delivery to the customer to aid in higher csi scores. This informational bulletin was created to inform that any accessories that are installed from the gm factory will be covered under the standard vehicle warranty and dealer installed accessories will be covered for a full year (12 months). This informational bulletin provides information to dealership personnel on properly eliminating unwanted odors in vehicles. This preliminary informational bulletin provides information to dealership personnel which may be helpful when addressing underbody component corrosion with customers. This informational bulletin provides information on general motors dealership critical equipment requirements and recommendations. This informational bulletin provides information and operating tips for the hands free lift gate. This informational bulletin provides information on chemical staining, pitting, corrosion and/or spotted appearance of chromed aluminum wheels. This informational bulletin explains the road force balancers and what they can do for customer concerns. This informational bulletin advises of a new fuel injection kit used for decarbonizing the intake valves, and explains how toptier fuels should be used to reduce carbon build up. This warranty administration bulletin provide policy information on required operating procedures. This informational bulletin provides information for use on a product assistance claim (pac), which is formally known as a product allegation resolution (par) claim. This informational bulletin provides information to dealership personnel on policies regarding a product assistance claim (pac) within the courtesy transportation assistance program. This bulletin provides information on approved warranty part numbers for original equipment batteries. This informational bulletin provides information for dealership personal and technicians when replacing the body control module (bcm), that a 2nd design bcm is not interchangeable with the 1st design bcm. This warranty administration bulletin provides information on dealer empowerment labor operations and customer enthusiasm. This technical bulletin provides a procedure to replace the axle nuts and washers if a clicking noise is heard on turns from the front. 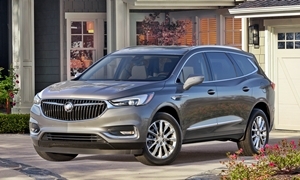 This informational bulletin provides information on how to contact and when to contact tac with issues involving the buick enclave. This informational bulletin provides information for dealers/technicians on an outside door handle or lock cylinder cover being loose, or falling off. This informational bulletin provides technicians with updated information to help identify the differences between what is considered a fluid leak, and what is considered seepage. This informational bulletin provides information for the ipc odometer programming method quick reference guide. This preliminary information communicates that the restriction for the gf9 trans assembly has ended. This preliminary information communicates a concern of a mil on with p0459 or p0443 setting and engineering investigating this condition.